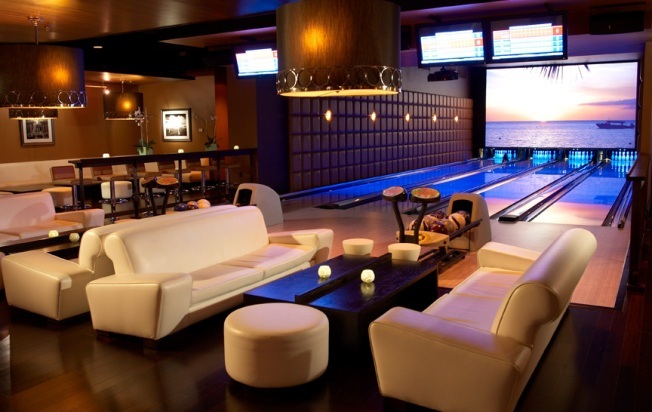 The MPD meets the PBA at Lucky Strike Lanes' Luxe Lounge. The newest of the nouveau bowling alleys, Lucky Strike Lanes, which opens to the public on Monday, October 27th, really deserves its new neighborhood. The club concept chain Lanes had already been franchised from Louisville to LA to Las Vegas, so Times Square seemed like a safe bet. Though to be fair, the West Side Highway at 42nd Street location, while just a short walk to Red Lobster and an even shorter walk to the aforementioned bus depot, isn't exactly taking up potential Disney Store real estate. Does thumping electro-trash, high heels (but not construction boots, which are expressly prohibited) and '90s-style bottle service go with bowling? Lucky Strike certainly seems to think so. It's one of the few lanes you'll find that has a dress code, which prohibits, among other things: chains, ripped or soiled clothing, headgear, MC colors (that stands for motorcycle club, for those of you scratching your heads), and plain white T-shirts (that's alright, the skinny-jean set were content with rolling at The Gutter in Williamsburg). If you show up expecting anything more than over-priced drinks and the sad sight of China Room castaways teetering toward racks of bowling balls, well, you're entering a world of pain.